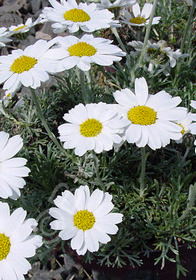 Large yellow-eyed, white daisies dance atop finely-cut, silver-gray leaves. This neat, low-growing form blooms on and off all summer. Choice selection for a protected spot in the rockery.